Online tickets sales are closed. Tickets will be available at the door. First Presbyterian is located on the corner of Dana and Channing, a block from Telegraph Avenue in Berkeley. On-street and garage parking are available. Rabbi David J. Cooper has been the prime mover in establishing the East Bay’s Kehilla Community Synagogue, founded in 1984, as a go-to shul for progressive Jewish social action in the Bay Area. Under his leadership, the synagogue has united an inclusive spirituality open to all with progressive political values. With interfaith and political coalitions, Rabbi David has also led his community in working to achieve peace, fairness, and social justice as central to Jewish spiritual practice. Beginning July 1, 2017, by his own initiation, Rabbi David’s rabbinic role will change. Having realized his dream of growing Kehilla into a strong and vital community, he will become what he calls “Active Rabbi Emeritus,” continuing to lead services, teach and organize Kehilla’s social justice actions. Rabbi Dev Noily will don the mantle of Senior Rabbi at Kehilla as well as actively maintain Kehilla’s embodiment of tikkun olam. 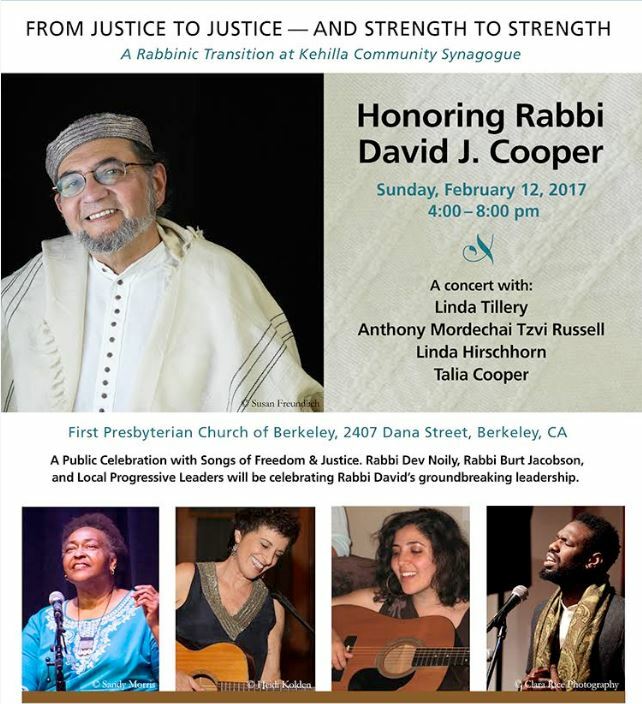 To celebrate Rabbi David’s more than 30 years of service to Kehilla and to social justice advocacy, Kehilla is hosting a public event on February 12, 2017 at the First Presbyterian Church in Berkeley. Linda Tillery, renowned singer, percussionist, and leader of the Cultural Heritage Choir will headline a concert of Songs of Freedom and Justice with Anthony Mordechai Tzvi Russell, a vocalist who marries Ashkenazic and African-American musical forms; Linda Hirschhorn, a cantor, singer and songwriter; and Talia Cooper, a folk singer, activist and satirist. The concert will celebrate the struggle for freedom from a multicultural perspective, drawing music from texts that explore the historical connections between enslaved Africans and enslaved Jews in Egypt, and our natural ties in today’s struggles for freedom and justice. Speakers will include progressive activists and East Bay spiritual and religious leaders whom David has worked with and other special guests. A reception with substantial hors d’oeuvres will follow the program.